Root For These 3 M'sian Teams In The Amazing Race Asia 5! The Amazing Race Asia season 5 recently unveiled the participants for season, and 3 out of 11 teams are from Malaysia. They consist of ex school mates, brothers, and beauty queens, and all 11 teams would be travelling around South East Asia, inclusive of Jakarta, Denpasar, Manila and Taipei. These 3 teams have outwitted thousands of other competitors in the region to battle it out in the current ongoing race. Here are the Malaysian teams that you should be rooting for, come its release in October 2016. The Amazing Race Asia would not be complete without a team of brawn and the 2 brothers also known as “the Muscles Brothers” certainly fulfil that quota. Their muscular looks aren’t always a good thing, as they found once while travelling in Thailand. The lads were told that they were “too big” and asked to leave the taxi they were in, right in the middle of a highway. The brothers, aged 21 and 23, however, won’t allow past experiences to dictate their current race experience and they stated that they are in the game to win it no matter what. 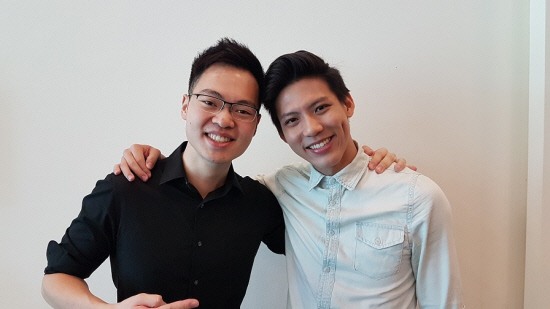 14 years of knowing each other led the pair of ex-school mates to finally running The Amazing Race Asia season 5 together. Brandon is best known for being an 8TV Quickie host, and Alphaeus is known for asking the POTUS some pressing questions not too long ago. Treating the race as a time to reconnect over the lost years, Brandon and Alphaeus deem themselves a pair of obnoxiously playful guys. What makes them good candidates for the race though, is the fact that Brandon is able to have the speed to set the pace of the race, and at the same time, he can leverage off of Alphaeus’ good sense of direction. Alphaues himself also has had the experience of travelling to 13 countries in 21 days across Europe, and that alone is a good preempt to a race around Asia. Beauty is what connects both racers together, but these aren’t just mere words used to describe them, for Yvonne is the Miss World Malaysia 2012/2013, whilst Chloe is the Miss World Malaysia 2011/2012. The pair have known each other for several years and hold several other accolades to their names, besides gracing the Miss World stage. For one, Yvonne was also the social activist for Osai Foundation, a 3R TV host, an event emcee and a brand ambassador. Meanwhile, Chloe, who is part French and part Chinese has walked the runway for international brands such as Chanel and Tiffany & Co. This time around, Chloe won’t be walking for a pageant nor fashion show, but she will be running the race with her best friend, Yvonne instead. We will be rooting for our Malaysian representatives and hope that they’ll do our country proud. The teams are currently on the race around Asia and the 5th season of The Amazing Race Asia will be broadcasted on local television by October. The 11 teams competing will be racing to take home the grand prize money of USD 100,000.